Most manual wheelchairs are used as mobility aids and are self-propelled. Manual wheelchairs are propelled by turning the wheels by hand usually by pushing on the round bars that surround the wheels called the “push rim.” There are also handles on the back so it can be pushed by another person. When using a manual wheelchair, users can wear fingerless gloves, much like weightlifters, as a way to protect themselves from dirt and injury. The mechanical workings of the manual wheelchair vary and are continually updated. However, most manual wheelchairs have a similar overall design. The basic manual wheelchair parts include push handles, rear wheels with the push rim attached, brake for the rear wheel, an anti-tip bar, and castor wheels. The castor wheels on the wheelchair are often overlooked but important part of the manual wheelchair. They make it easy for the wheelchair to maneuver. Also, a basic manual wheelchair will include a backrest, armrest, a cushion seat frame, and a calf strap footplate. To go forward, reach backward as grip the rush rim as far back as you can and push the wheels forward by keeping hold of the rims moving in a forward direction. Moving backward, reach forwards and grip the push rim and push backward. Turning right or left, hold the wheel of whichever side you want to go and push the opposite wheel forward. To turn right, hold the right wheel still and turn the left wheel forward. Turn left by holding the left wheel still and turn the right wheel forward. When in a tight corner, you may need to spin on the spot. To do so, push one wheel forward and the other backward simultaneously. To stop while in motion, grip the rims and use friction to slow down. Pinch the push rim with your thumb and your index finger. If the wheels are wet, then you may need to pinch the tires instead. It is important to keep in mind that the friction can cause discomfort or burn depending on the speed at which you are stopping. If you are stopping and intended to stay in a particular spot, put on the brake to keep the wheelchair from rolling backward. 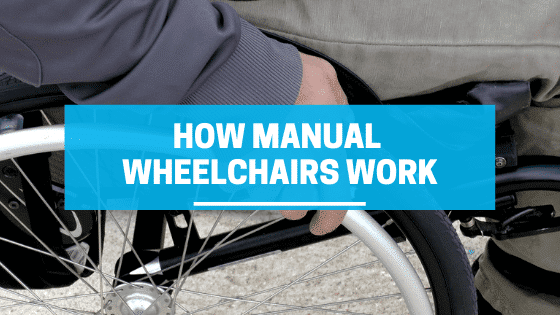 Manual wheelchairs work fairly easily. By understanding how they work, you can see if this chair is for you. Since this is a self-propelled chair with the use of your limbs or with the assistance of a companion, there is a bit of effort needed to maneuver oneself around. This wheelchair is and has been one of the more popular designs for years. This entry was posted in Lightweight Wheelchairs, Wheelchair. Bookmark the permalink.